For some reason, protein powder kept popping up in both Joe and I’s lives. So, we had to make a comic about it. I agree with Joe that none of these names is sillier than Muscle Milk. Special thanks to Pete and Jason. As Doc mentioned, I’ve recently been attempting to bulk up a bit, thanks in large part to the advice of Mr. Jason Elliot. This strip has been a lot of fun to work on, and it would be a disservice to you fine folk to not share some of the powder names that didn’t make the cut. Did you begin lifting? You on Fitocracy yet? Pending successful advice from Mr. Jason Elliot, should you get huge, I reccomend a new alter-ego. MST3k did most of the work. 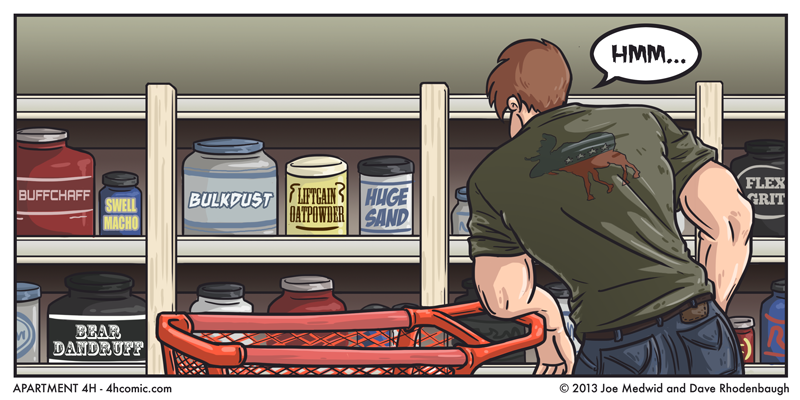 Nothing is funnier than Muscle milk. Do you guys even lift? I like the Bull Moose party logo on the back of the t-shirt. Wonder if TR supplemented?